Born from the contrast of the song ‘Ange et Dû?mo’ and the poem ‘Libertû?’ of Paul Eluard, we’re so stoked to share this styled shoot with you, hopefully leaving you feeling inspired for days to come! Entitled ‘On The Wings of Freedom’, this inspiration shoot brought together a lovely group of vendors at LC Horse Farm in New Zealand (with it’s beautiful lush green fields). Just like in the song ‘Ange et Dû?mon’, the shoot featured an angel wearing a beautiful tulle bridal gown from Hera Bridal. 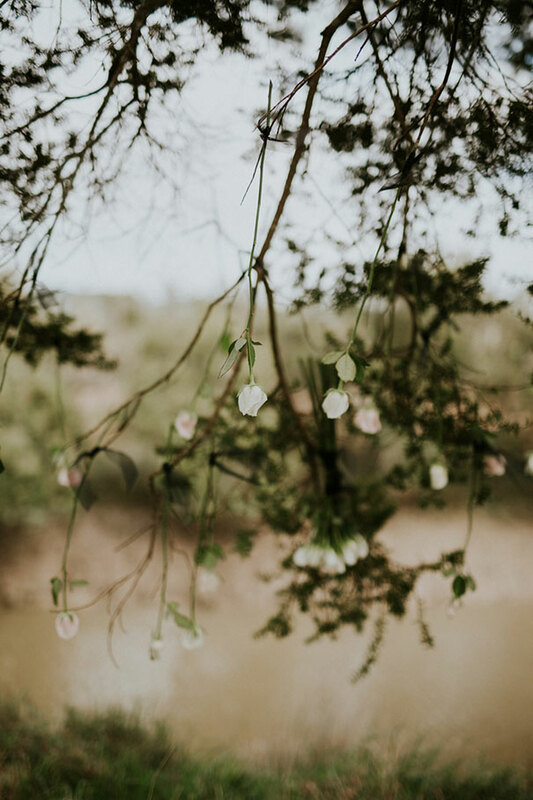 This magical shoot was captured by Amy Kate Photography, having been enlisted specifically for her moody style, full of depth and meaning.?? Adorned with crowns from Anna Marguerite and hair and makeup beautifully done by Eleanor Dorn Makeup? ?, local celeb Vicki Wilson, adorned in The Gold Lane jewellery. To reinforce the contrast between the angel and the devil, De Coeur a Coeur and Weddings by Paris worked to create a dark and moody atmosphere with gorgeous gold accents. This dramatic atmosphere makes the bride battle to gain her freedom… or more obviously, the freedom to be herself. The table setting, hidden deep in the trees surrounding the farm, added a touch of gold and elegance to the shoot thanks to the stunning garland from Belle Floral Design, beautiful dinnerware from Claybird Ceramics, the striking cake and macarons from Magnolia Kitchen (yum!) and flawless calligraphy from Darling Devotion. A true work of art with a beautiful meaning behind it, On The Wings of Freedom has left us wishing we’d thought up this daring design and of course the delectable desserts! CREDITS Photos Amy Kate Photography // Creative Direction and Production De Coeur a Coeur and Weddings by Paris // Stylist Weddings by Paris // Dress and veil Hera Bridal // Headpieces Anna Marguerite via Etsy // Jewellery The Gold Lane // Hair and makeup Eleanor Dorn Makeup // Suit Shop Hudson // Stationery Darling Devotion // Flowers Belle Floral Design // Location LC Horse Farm, NZ // Cake and other desserts Magnolia Kitchen // Dinnerware Claybird Ceramics // Model Vicki Wilson // Cinematographer De Coeur a Coeur.